RAID is officially back in action! After a long winter sleep we are now back at Minna Bluff for a new season of testing. 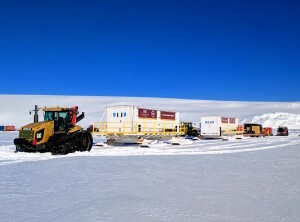 Our lead drilling party left the US in early November and after many weather delays finally made it to McMurdo Station in Antarctica from New Zealand. The guys dove into de-winterizing all the RAID equipment and quickly got things ready to move out on traverse. 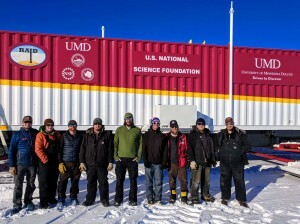 They set off from McMurdo on November 28th with the traverse team by tractor-pulled sleds, and headed to our Minna Bluff test site. 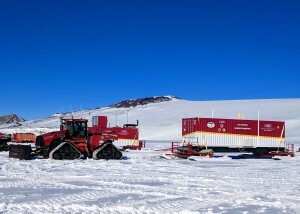 After three days they pulled onto the grounded ice section where we will set up camp. For the traverse to our site, we are combining forces this year with the SALSA project. The traverse team includes vehicle drivers, mechanics, and two of the RAID drillers, Rich and AJ. The traverse crew prior to departure from McMurdo. Looks like fine weather. Our guys are Rich (green hoodie) and AJ with the big smile and red and blue cap. It’s exciting to see the RAID modules moving again, here pulled by a Cat tractor. The white modules with catwalks are the drill and rod modules, which will be joined up later to make the drilling platform. Lining up the RAID modules with a Cat tractor. Here go two other modules to join the caravan — the power unit with diesel generators and the fluid recirculation unit, being pulled by a Case quad-trac. Moving modules into position from the winter-over site with a Case tractor. 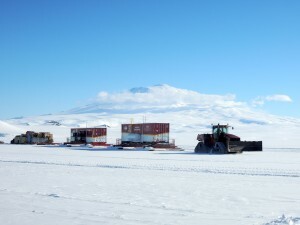 Finally, one of the tractor-trains moves out on departure day, passing in front of Mount Erebus. Third sled is piled high with all the materials needed to set up a camp. Looks like the Beverly Hillbillies, but believe me the traverse and camp crews have things well organized! Traverse departure from McMurdo on November 28th. A good clear day for an outing. The views expressed here are personal reflections that do not represent either the RAID project or the National Science Foundation. © RAID 2019. The text, images, data, audio files, video files and clips, documentation or other information contained on the RAID Project website (collectively, the "Materials") are proprietary to the RAID Project.